- Brett telling Danni to give Packo the money back and tell her what really happened. Danni insisting that she's not a dobber. - Sam refusing to tell Gaby what job Alan Crowley has offered him. - Julie trying to get Philip to change his mind about going out with the guys. 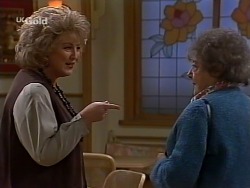 - Lata suggesting to Brett that they could spend the day at her place – alone. Brett looking shocked and horrified. Lata asks Brett if he doesn't find her attractive. Brett insists that it's all a bit sudden, that's all. Lata snaps that she understands; he doesn't have to say anymore. She storms out of the classroom. Marlene is trying to find out from Sam what his new job is, commenting that he seems embarrassed to talk about it. Sam replies that he's a gym instructor – sort of. Lou lets her go. 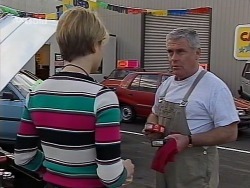 Philip rocks up and asks Lou if he's still going on that bash to the Outback. Lou nods that all he and Doug have to do is raise $5,000 for charity. Philip murmurs that he wishes he was going too. Lou laughs that Julie wouldn't let him, would she?! Danni walks in with Lata and they sit down at a table. She asks Lata what happened. Lata replies that Brett doesn't find her attractive; he thinks she's *different* to all the other girls. Danni asks what he said exactly. Lata replies hesitantly that he doesn't like her enough to… do it. Danni asks why she's in such a rush to do it anyway. Lata shrugs that she doesn't know – but at least she knows now how Brett feels about her. She goes on sadly that Brett's been the only guy to take an interest in her and she thought he'd be her boyfriend. Danni tells Lata that she's gorgeous; she shouldn't let Brett upset her; she'll find someone. Marlene is commenting to Cheryl that Danni has to come up with a reason why she shouldn't be expelled. Cheryl nods that *she* can't think of one good one unless she goes to the school and grovels and pleads on her behalf. She shows Marlene around the bar. Marlene starts making suggestions to change things round, but Cheryl reminds her that she's just there to help out! 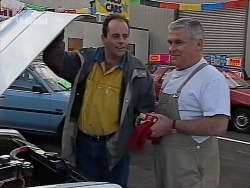 Danni is back at the car yard and Lou asks if Miss. Stoner is all right. Danni nods that she is, but she was disappointed because she thought Danni liked her. Away from Lou, Brett joins Danni and suggests curtly that she tell the truth; being a martyr isn't cool. Danni just shrugs this off and retorts that Lata practically threw herself at him and he ran away: he's hopeless! Rick is vacuuming the lounge room when Cody comes in. He turns off the machine and tells her that Brett reckons Danni isn't the brains behind the octopus; it's Packo. Cody sighs that she's going to have to do something: she's School Captain and she can't ignore an injustice. Sam comes into the bar with a red- headed middle- aged woman, who's talking to him enthusiastically, saying that that was the best she's ever had; he was worth every cent. 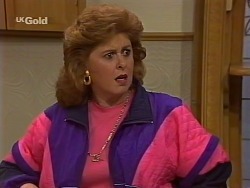 Behind the bar, Marlene hisses to Cheryl in shock that Sam isn't a gym instructor; he's a gigolo! Cody is telling Danni angrily that she doesn't want to see her expelled for something she didn't do. Danni retorts that if she was to say who really put that octopus in there, her life wouldn't be worth living. Cody says she'll tell Miss. Teschendorff that Danni is covering for someone else. Danni shrugs at her to go ahead; she'll just deny it. Marlene snaps at Cheryl that she's not having it, and she storms over to where Sam is sitting with the woman and clips him round the head! Sam asks in astonishment what that was for and Marlene tells him that that woman had her hands all over him and she's old enough to be his mother. Sam retorts that he's her personal trainer. The woman, looking taken aback, gets up and walks out. Cheryl snaps at Marlene and Sam to sort it out at home, not there. Sam storms off across the complex. Philip is sitting outside the coffee shop when Julie walks over and asks if he's enjoying some peace and quiet. Philip nods that he *was*… Julie asks if she can have her lunch with him – she wants to talk to him. Philip, however, says he has to rush off, and he gets up and leaves her. Sam is laughing as he tells Rick and Mark that apparently he's a gigolo! Mark asks where Marlene got the idea and Sam explains that it's because he's now Lassiter's personal trainer. Rick laughs that there'll be rumours! Sam heads out to get ready for the footy. Julie walks into the Waterhole and asks Marlene in surprise what she's doing behind the bar. Marlene explains that she's just helping out. She then tells Julie that Danni had a letter from Michael today: he's trying to make it home for her 18th birthday. Julie remarks coolly that that's the first *she's* heard of it. Marlene comments that Michael seems to have a good relationship with *Danni*. Julie retorts coldly that Danni has *always* had Michael under her thumb. Marlene warns her angrily not to say anything about her granddaughter. Helen and Hannah are doing some Tai Chi when Julie comes in. She heads through to the kitchen and unpacks some groceries. 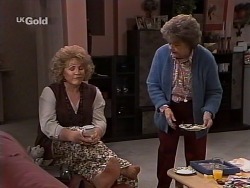 She then asks Hannah if she and Helen can go out tonight, as she wants to cook Philip's favourite meal. Helen asks if that's wise. Julie insists that she wants to make it up to him. Helen warns her not to string him along or bully him to get her own way. Julie insists that *she* wants what *he* wants. It's evening- time when Philip arrives home to find Julie wearing a little black dress, the house lights dimmed and the kitchen table set for a romantic meal. Julie tells him that she's cooking tuna mornay – his favourite – and Helen and Hannah have gone out. She hands him a glass of champagne. Philip, however, tells her tersely that she knows this is his night out with the boys: they planned ages ago to go to the footy. He goes on angrily that it's *always* like this: everything is on *her* terms. With that, he walks out, leaving Julie looking furious. Marlene apologises to Sam for clipping him round the head earlier. Sam comments that, apart from the punch- up, how was it today? Marlene smiles that she loved it – and it's another outlet for her Roxanne Marie products. Sam sighs and reminds her what they did to Rick's face. Marlene insists that Rick must have strange skin. Lou, Philip, Rick, Sam and Brett are all sitting in the lounge room, watching the footy preview on TV and discussing the merits of Julia Roberts! Mark comes in and Lou tells him that they're going to thrash his team tonight! Philip is looking at the Variety Club of Australia's brochure about the ‘Fink to Fannie Bay NT Bash' and he comments that he'd love to go on it. Lou tells him that, unfortunately, Doug has already said yes. With that, everyone stands up and heads out. JULIE: I've lost my husband, now, because of you. CHERYL: I think you ought to go home now – and when you go home, I want you to take a long, hard look in the mirror, and you will see what the only friend you've got in the world looks like. Julie storms out furiously, leaving Danni to comment to Cheryl that that was wicked. The guys arrive back at No. 30, talking about the fact that the footy match was a draw. Philip comments that they should do this more regularly! He adds that he wishes Lou's Holden was a bit bigger: they could all go on this rally. Lou remarks that there's space for one more person, and he suggests that whoever raises the most money for charity can come with him and Doug! A while later, in the kitchen at No. 26, Philip is telling Hannah and Helen happily that he had a great night; he'd forgotten what it was like. Julie walks in, listening as Philip enthuses about the game. She comments to him coolly that that will be enough testosterone for tonight. Helen and Hannah head off to bed, leaving Julie to ask Philip coldly if it was good to be back in kindy, playing with the other little boys. Philip sighs that she just doesn't understand, does she? Julie snaps that he's just being childish. With that, Philip grabs his keys and says he's going to sleep at the news- agency. He marches out, leaving Julie looking astonished.